A Supreme Court Bench comprising of Justice H.L.Dattu, Justice P.C. Ghose and Justice S.A. Bobde has directed CBI Chief Ranjit Sinha to submit all documents relating to the alleged attempts to seek a reopening of the 2G Spectrum scam case, which is nearing completion now. The Bench rapped CBI for jolting out of the probe supervising officer, DIG Santosh Rastogi, from the 2G spectrum scam case and directed CBI’s special counsel K.K. Venugopal to ask CBI to “rectify the mistake immediately”. CBI had reasoned that the charge sheet against Swan-Reliance Telecom (ADAG) needed to be revised. The Supreme Court taking cognizance of the alleged death of seven tribal girls in Andhra Pradesh, Telangana and Gujarat during clinical trials of a cervical cancer vaccine ordered the central drug control authority and Indian Council for Medical Research to tell how permission for human trial of the drug was given. The Court also asked the files relating to licenses given for the administration of two vaccines for cervical cancer prevention. A bench comprising of Justices Dipak Misra and V Gopala Gowda also asked the Indian Council of Medical Research (ICMR) to place before it the file dealing with the vaccine. An Apex Court bench comprising of the Chief Justice of India, R.M. Lodha, Justice Kurian Joseph and Justice R.F. Nariman, came down heavily on the repeated misleading campaign going across to defame the judiciary and lamented the damage caused to the entire institution due to the same. A Supreme Court Bench comprising of Justice R. Gogoi and Justice M.Y. Eqbal reversed a Madras High Court judgment and upheld the punishment of compulsory retirement for a Judicial officer accused of sexual abuse at workplace. The appeal was filed against the 2007 judgment of the Madras High Court, which had reversed the compulsory retirement imposed on the respondent, Thiru K. Muthukumarasamy and exonerated him of all the charges. A Supreme Court bench comprising of CJI R.M. Lodha, Justice Kurian Joseph and Justice R.F. Nariman ruled that a decision taken by the Lok Sabha speaker in the House is not open to judicial review, dismissing as withdrawn a PIL filed by Advocate M.L. Sharma. The PIL challenged the ruling by the then Lok Sabha speaker G.V. Mavalankar wherein he had ruled that for an opposition party to be recognized so with its leader being the Leader of Opposition, it must have a minimum of 10 percent seats of the sanctioned strength of the House. Sharma had demanded Congress leader in Lok Sabha to be appointed as the Leader of Opposition, as it is the largest party in opposition, satisfying the criterion under the 1977 law on salary and allowances of leaders of opposition in parliament. The Apex Court in the case J.J. Irani v. State of Jharkhand held that complaint is being barred by limitation as it was filed three months after the offence came to the knowledge of the Inspector.It passed the order on a petition filed by Mr.Irani challenging the judgment and order of the high court dated June 15, 2007 allowing the criminal revision filed by the state, and reversing the order dated June 29, 1990 of the magistrate. 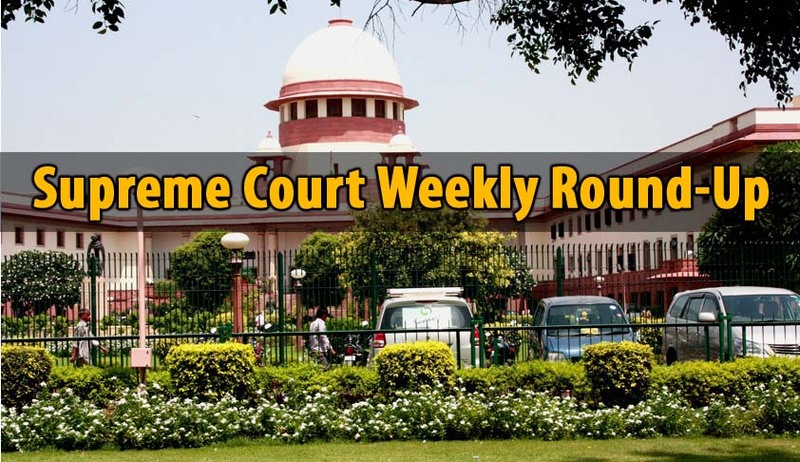 The apex court bench comprising Justices S J Mukhopadhaya and S ABobde set aside the high court order, allowing initiation of criminal proceedings before the chief judicial magistrate in Jamshedpur. A two Judge Bench of the Supreme Court of India held that having accepted the final report the learned Magistrate had not become “functus officio” and was denuded of all power to proceed in the matter. In Rakesh and another vs. State of UP the Supreme Court [Crl. Appeal 1412/2014] examined the question “whether a Magistrate after accepting a negative final report submitted by the Police can take action on the basis of the protest petition filed by the complainant/first informant? “ and answered in the affirmative.